Necklace. 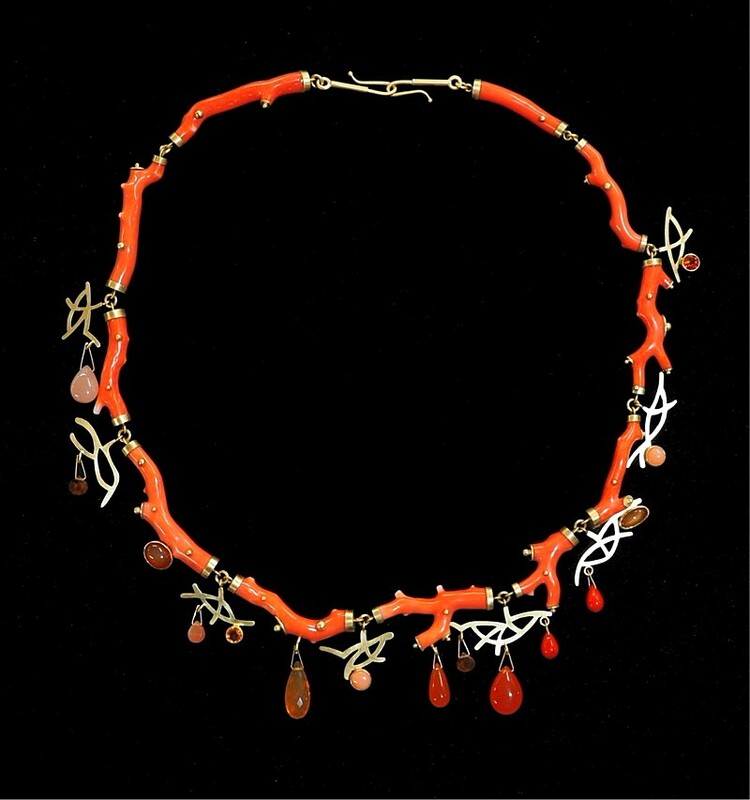 Branch coral, 18K gold, coral, fire opal, garnet, chalcedony, citrine. 0.5" x 21.3" x 1.6"
Necklace. 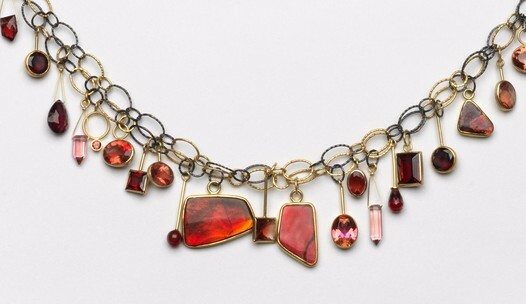 Oxidized silver,18K gold, 22K gold, 14K gold, ammolite, andesine labradorite, ruby, garnet, topaz, tourmaline, carnelian. Constructed. 0.25" x 25" x 1.2"
Earrings. 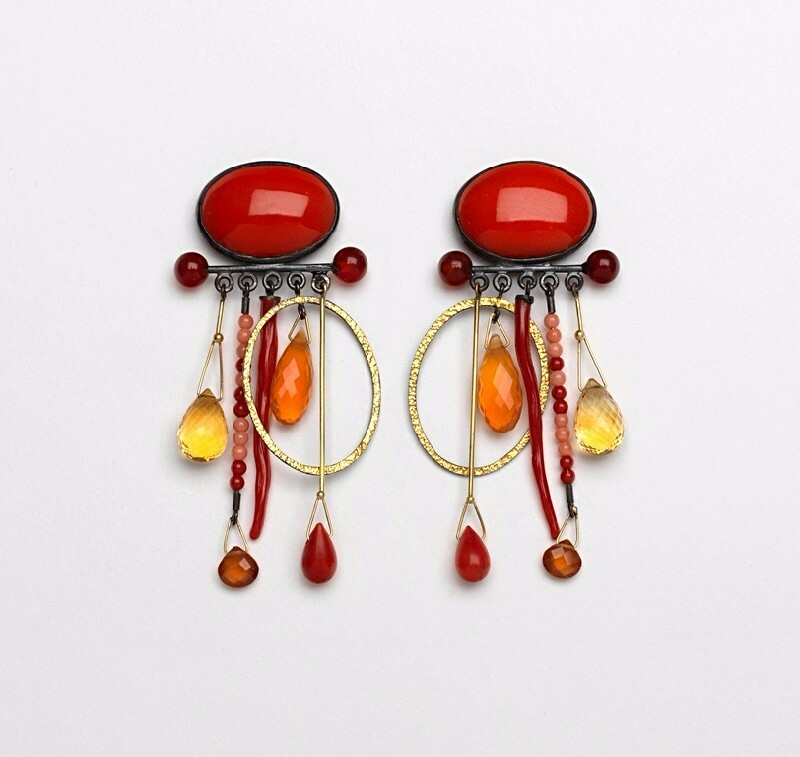 Oxidized silver, enamel, 18K gold, coral, gold leaf, fire opal, citrine, hessonite, carnelian. Constructed. 0.2" x 2.56" x 1.14"
Earrings. Silver, enamel. topaz, moonstone, mother of pearl. Constructed. 0.2" x 2.56" x 1"
Earrings. Oxidized silver, enamel, gold leaf. Constructed and pierced. 0.12" x 2.17" x 1"
Suzan Rezac is known for her mastery of inlay, using gold, silver, copper and especially the Japanese alloys shibuichi and shakudo. She draws her inspiration from nature and natural forms, archaeology and ancient cultures, all sources of influence for Rezac’s continual exploration of the decorative arts, culminating with her elegant, extraordinary jewelry. A recipient of a National Endowment for the Arts fellowship, The Rafael Prize and the prestigious Herbert Hoffman Award at the International Jewelry show in Munich. Suzan has exhibited nationally and internationally at such institutions as the Renwick Gallery of the Smithsonian Institution in Washington DC, the Philadelphia Museum of Art, the Montreal Museum of Decorative Arts and the National Museum in Zurich.. Her work is held in the collections of the Museum of Fine Arts in Boston, the Museum of Fine Arts in Houston, the Philadelphia Museum of Art, the Cooper-Hewitt Museum in New York, and numerous private collections. For this new series of work Suzan Rezac has combined gem stones with some embellishments of enamel work. Rezac has collected scores of gem stones for many years. Each stone is beautiful in its uniqueness, but dazzlingly rich when grouped with others. A superb colorist, Rezac painstakingly combines, recombines, and separates stones until each piece exudes a harmonic balance of color, shape and size.